According to Compete’s Q3 2009 Smartphone Intelligence Survey of nearly 2,000 smartphone owners, 37% purchased something non-mobile with their handset in the past 6 months. While that’s still far from a majority, the study found that at least 68% of smartphone users conduct some mobile shopping activity, such as looking for reviews, shipping information, or store coupons. 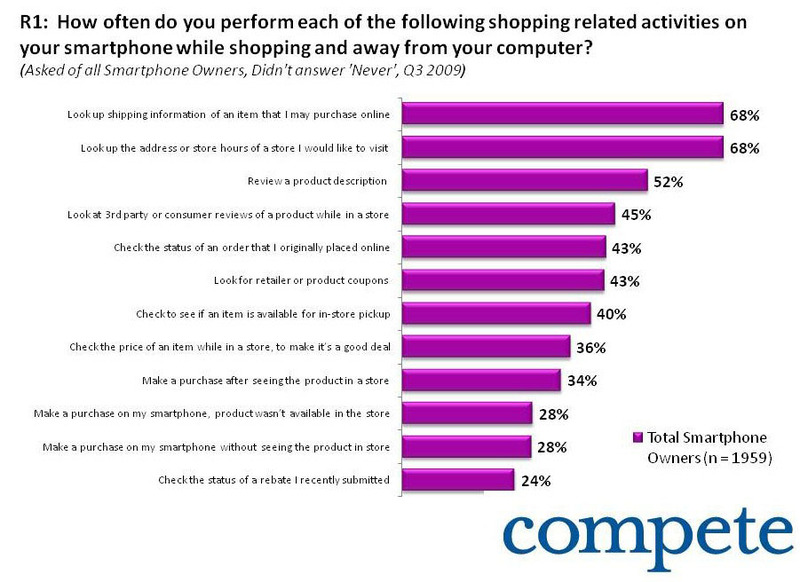 The study found that iPhone and Android users were the most likely to conduct shopping related activities. Over 40% of iPhone and Android users said that they are likely to check sale prices at alternative locations on their mobile phones while they are shopping. They are also likely to read product reviews while out shopping, with 39 percent of iPhone owners and 31 percent of Android owners saying they’ve looked at reviews from their handset before making a purchase. The most frequently purchased items on smartphones were music, books, DVDs, video games, and movie tickets — all relatively low priced items. Android and iPhone users, however, expressed a much greater interest in making larger purchases by phone, with more than 50% saying they would spend more than $25 on a single item purchased by smartphone. Comscore’s research on media usage of smartphone owners reached a similar conclusion — that iPhone and Android owners are much more likely than other smartphone users to engage in activities beyond basic smartphone functions like reading email. For example, the study showed that 80% of Android and iPhone owners read the news on their devices, compared to only 65% of total smartphone users and only 14% of non-smartphone users. The excitement about Nexus One, the Android phone released by Google today, will surely speed the adoption of smartphones. The question is, are retailers leaving money on the table by not having mobile optimized sites or apps? Expect a boom for m-commerce technology companies like Usablenet, Digby, and mPoria.